Amps: 45.8/22.9 Fuel Tank Capacity: 5.0 gal. Engine Alternator: Brush Width: 18-3/8"
Height: 24" Generator Mfr. 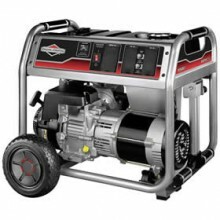 Warranty Details: 2 yr.
Click the button below to add the Briggs & Stratton 30658 - 5500 Watt Portable Generator to your wish list.